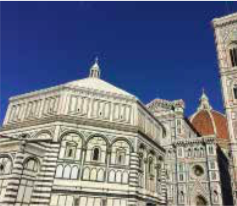 Entrance ticket to the Baptistery was abolished last month for all Florentines and all residents of the province of Florence. To access the religious building, which has the status of a minor basilica, it is now enough to show a document indicating residency in the city, or in the province, of Florence. Until last month, entrance was free only on occasion of religious masses, otherwise possible upon showing an entrance ticket valid also for the Dome’s cupola, the Giotto’s Bell Tower, the Crypt of Santa Reparata and the Opera Duomo Museum. “In accordance with Archbishop Giuseppe Betori, the great museum of Florence’s Dome has decided to make it accessible to all Florentines and those resident n the province of Florence this place of worship too, as it had already been done in the past with the Cathedral,” said Luca Bagnoli, president of the great museum of Florence’s Dome. Constructed between 1059 and 1128, the Baptistery is one of the oldest buildings of Florence. Although the Florentine Romanesque architectural style in which the monument is built is not as famous as its Pisan or Lombard counterparts, it was essential in the subsequent development of Florentine architecture, especially in the works of Francesco Talenti, Leon Battista Alberti, and Filippo Brunelleschi. The Baptistery has three sets of bronze doors that hold relief sculptures. The southern doors were completed by Andrea Pisano and the northern and eastern doors by Lorenzo Ghiberti. The eastern doors, perhaps the most famous ones, named Gates of Paradise, were made by Michelangelo. The doors of the monument, however, are copies, the original ones can be seen at Opera Duomo Museum. 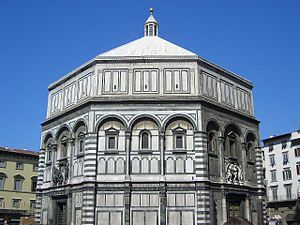 Until the end of the 19th century, all Catholic Florentines were baptized in the Baptistery. Among the most famous ones who received their first sacrament here are Dante, as well as many other personalities of Renaissance Florence including members of the Medici family.